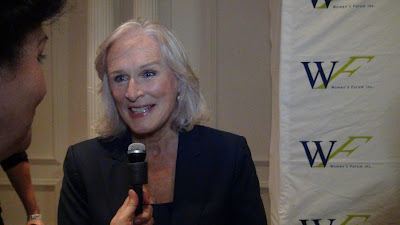 Below is the latest video, 'One to One with Gloria' and Glenn Close during red carpet at The 3rd Annual Elly Awards at The Plaza Hotel, New York City on June 25, 2013. The opportunity to meet and interview Glenn Close, who presented the award to her dear friend, Pat Mitchell, was truly an inspiration and amazing. Close is a six-time Academy Award nominee -- holding the record for having the most Academy nominations (along with Deborah Kerr and Thelma Ritter). Close also has three Tonys, an Obie, three Emmys, two Golden Globes, and a Screen Actors Guild Award, has been nominated three times for a Grammy Award and once for a BAFTA, amongst others. 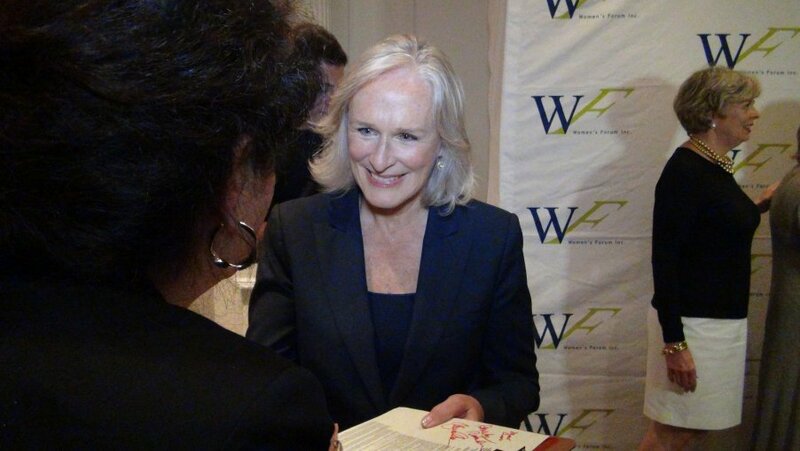 Close was named Entertainment Industry Foundation's ambassador for the 2006 “Key to the Cure” initiative, a charity endeavor that has raised more than $20 million in seven years to benefit EIF Women’s Cancer Research Fund. Close helped design and signed a pair of shoes for the Stuart Weitzman charity shoe auction benefiting ovarian cancer awareness and research and co-created “Bring Change 2 Mind” in order to reduce the stigma attached to mental illness, from which both her sister and nephew suffer. Watch, learn, be inspired and stay tuned for more exciting “One to One” event videos! Here’s to looking at another one of my proudest moments. And there will be more exciting "One to One" interviews to follow so please bookmark this page and follow the AllThingsDigitalMarketing blog. Thanks! More information about The Elly Awards event is at blog titled The 3rd Annual Elly Awards honors Maria Cuomo Cole and Pat Mitchell: Eve Ensler moderates leadership conversation with honorees. There's plenty of Elly Awards photos on FACEBOOK too! Hope you find this event coverage relevant, informative and useful. Please feel free to share your thoughts in the comments section below. Thanks! Please feel free to spread the news with your social networks and share your thoughts in the comments section. Thanks! All videos and photos by allthingsdigitalmarketing.com.